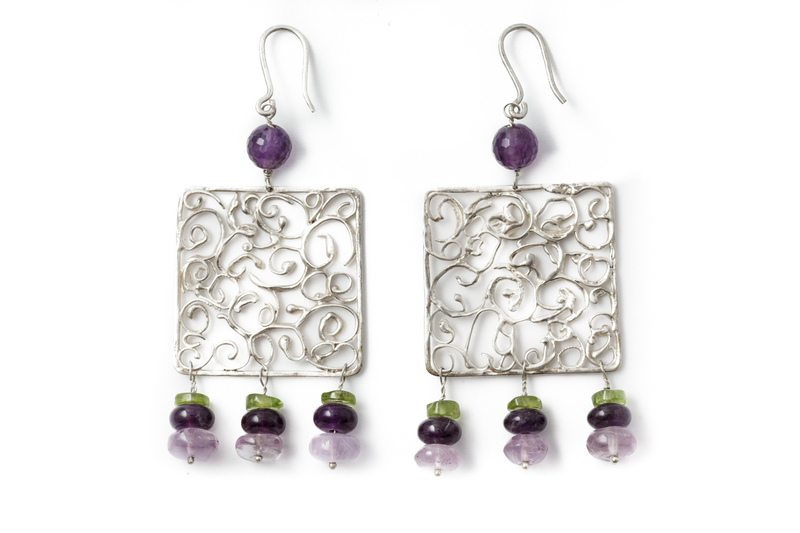 Housed in a thin silver frame, the curl-shaped design creates a precious embroidery while small amethyst and olivine pendants add shiny colourful effects. 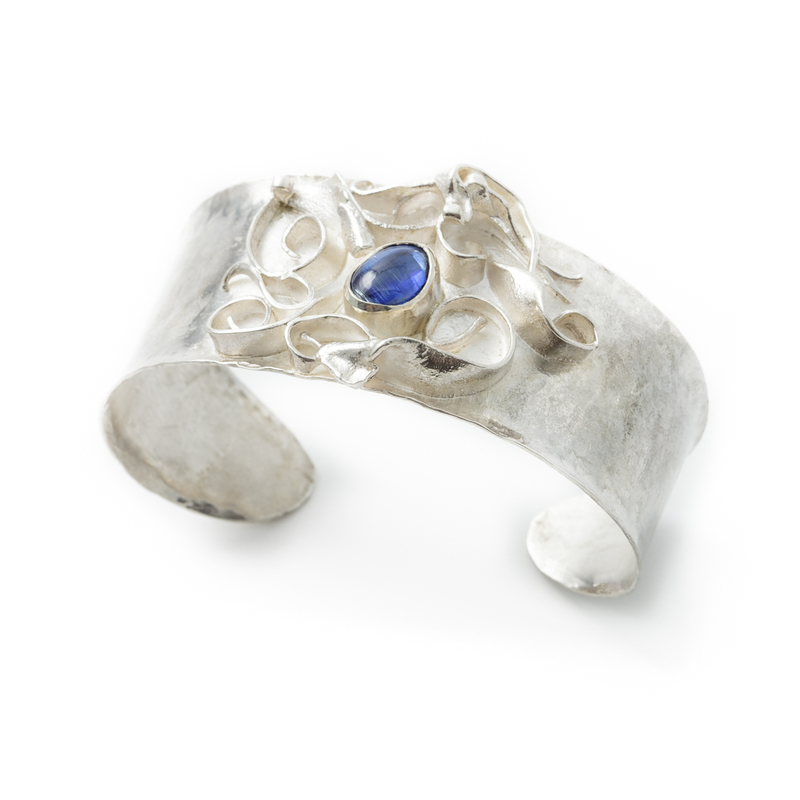 Silver bracelet with stone kyanite bezel mounted on a curved plate and hammered. Carved with fire, it merges the severe rigidity of the plate and the frivolous plasticity of the central decoration, that houses the intense blue of the stone. 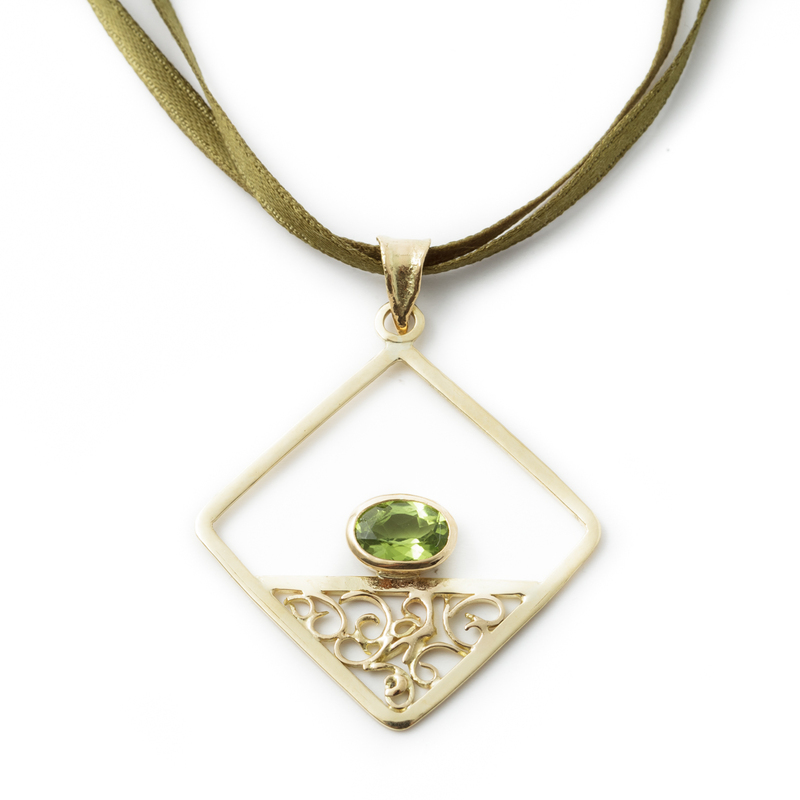 Gold pendant with central olivine stone bezel. Housed in a thin gold frame, the curl-shaped design creates a precious embroidery that highlights the bright colouring of the stone. 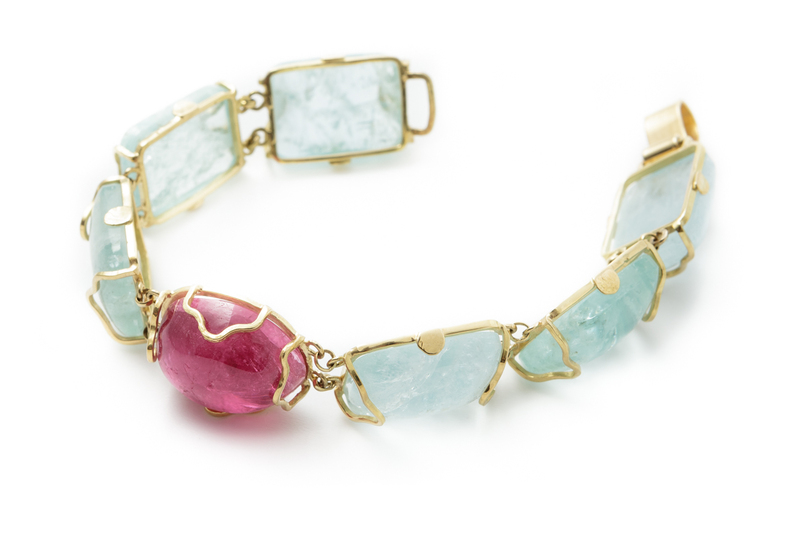 Precious gold bracelet with rose quartz and aquamarine. 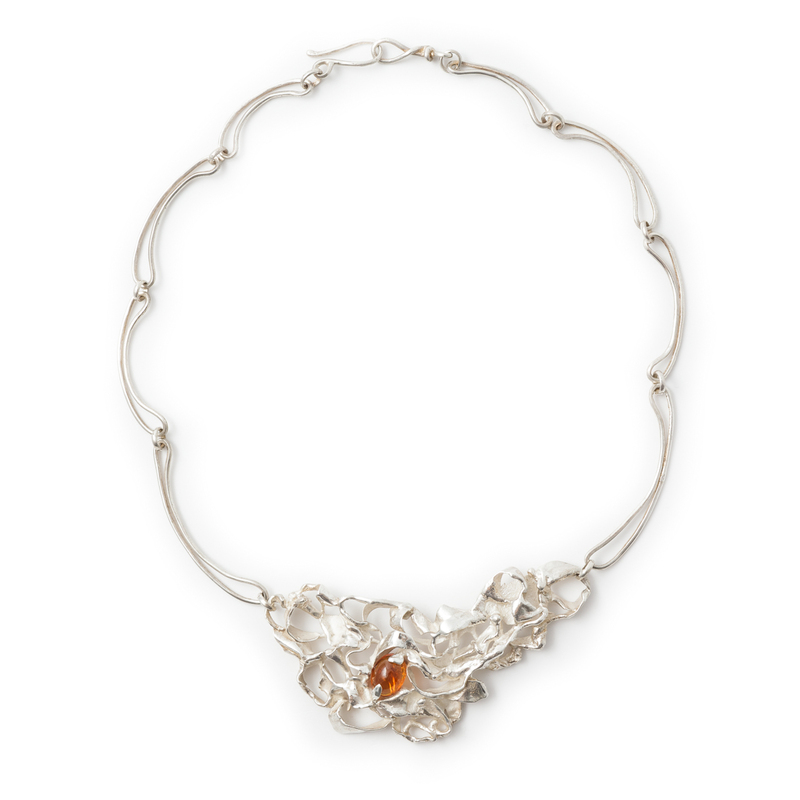 The design of the artefact, hand-made using flat section wire, features barely outlined bezels and it underlines the chromaticism and shine of its stones, almost in the rough, bestowing a light and sophisticated effect. Nicola Manca's Orfevre workshop opened in Nuoro in 1990, at via Gramsci, under the supervision of Professor Franco Manconi, a skilled goldsmith and eclectic artist, learning the secrets of classic goldsmith's art and focusing on original intepretations of Art Nouveau. In 2001, he starts a new business at Piazza Mazzini, near Corso Garibaldi, providing a new momentum to his productions, with a distinctively personal touch, underscored by an evocative chromatic combination of the natural stones and the metal crafted using the exclusive fire carving technique. He developed his extensive expertise studying marketing and gemmology. He participates in major fairs and sector event with his charming and evocative creations. Precious earrings, bracelets, necklaces, pendants, diadems, rings, made with precious stones embellished with gold, silver or platinum, are the main characters of his collections. Stones, polished and mounted with mastery or intentionally kept in the raw, are the heart of the aesthetic balance. Materials are embellished with new ideas and intuitions, unusual plays of light and sophisticated chromatic harmonies. Each stone is different and unique, each jewel has a modern and essential taste. Precious, still discreet and functional. The fire carving technique that shapes precious metals is the main feature of his production. Traditional goldsmith's techniques are performed and reinterpreted with mastery and a personal touch, a synthesis of his creative process, focusing on experimentation, characterizing his production.